This term we’ve tried two different type of collaboration websites. I used to be a big fan of Dabbleboard but when it folded I didn’t look for an alternative. I’m not sure why because I loved the whole share-for-all that could take place. Recently I was pointed towards TodaysMeet and then stumbled onto AnswerGarden so I thought I give them both a go. 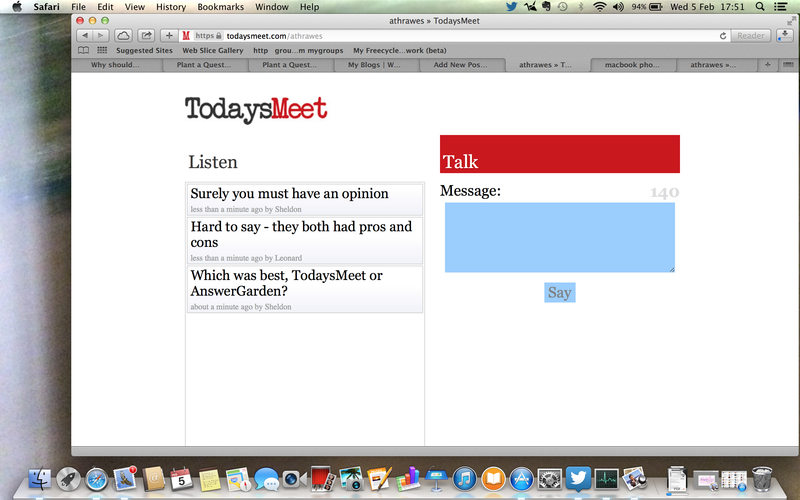 We used TodaysMeet when we were listening to a piece of classic music. The children had iPods, iPads and computers available and worked either independently or in pairs. The website is really easy to use and I liked the fact that you could set the room to disappear after you had finished using it. 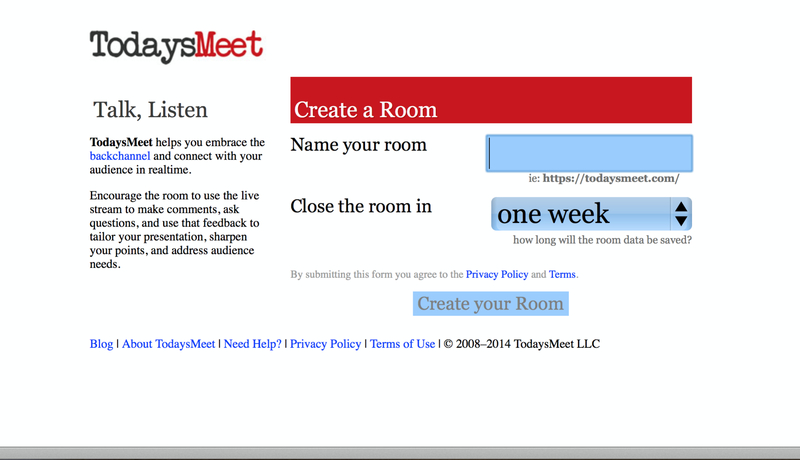 Once you create your room you share the link with the children and they are able to sign in and join the conversation. They can add as many comments as they want – comments are limited to 140 characters. The only problems we encountered were a couple of MacBooks that wouldn’t load the site – later I realised I hadn’t added the proxy settings to https – once I did they were fine. It worked perfectly on the iPads. The music session worked well, better than I had anticipated – all the children were engaged and they collated a powerful set of words and phrases inspired by the music we were listening to. They were all engaged and on task. Everyone made contributions, and those sharing hardware didn’t have any problems taking turns to type. At the end I was able to generate a transcript – this gave me the whole conversation and told me what each group had contributed during the session. AnswerGarden describes itself as a ‘digital scribble space’. First you create a ‘Garden’ by asking a question. You can then choose the mode that you want to work in. Classroom Mode was the one I tried today – pupils can submit as many answers as they want. Once the room is created you share the link with the pupils and they all see the question. As they type their answers they appear in a word cloud beneath the answer box. Answers are limited to 20 characters. I thought this might cause a problem but as we were only collecting words and phrases it worked well. It also made the children think carefully about their choice of words. It even prompted a discussion about synonyms. 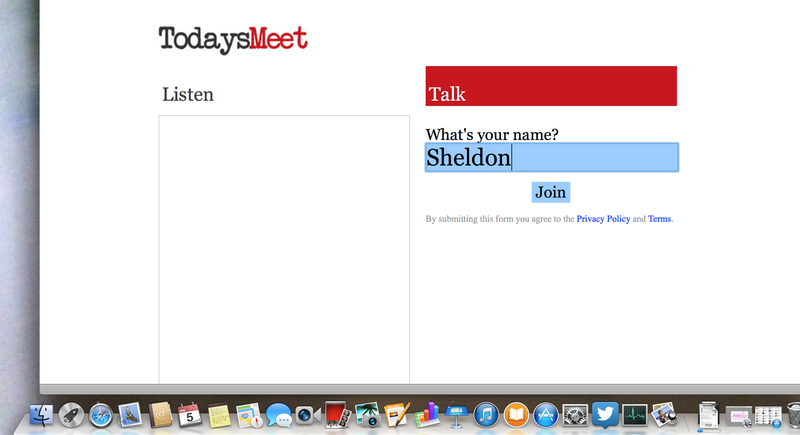 Unlike TodaysMeet you can’t see who has submitted an answer. The words populate a WordCloud below the question. Users can’t repeat the same answer themselves but if they submit the same word or phrase as someone else the text increases in size (just like Wordle). There are lots of things you can do when you have finished. These include turning your final cloud into a QR code and exporting the data into Wordle. 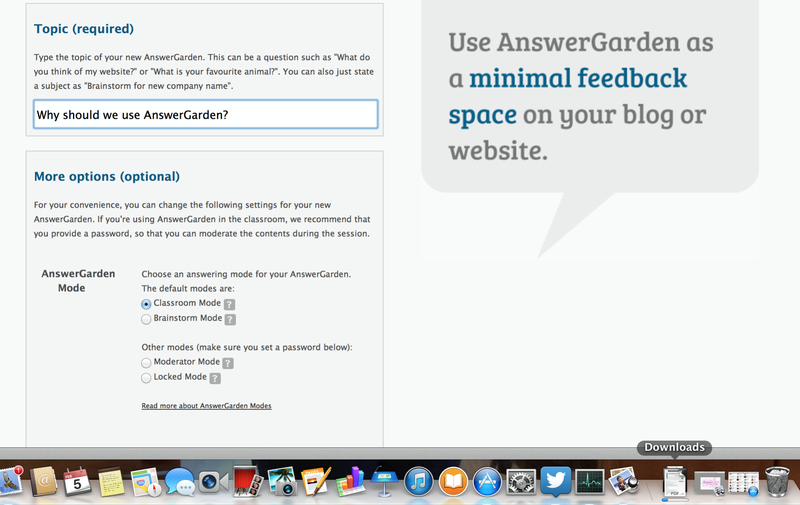 The main downside to AnswerGarden was that in Classroom mode I couldn’t edit the text although I have a feeling if I had created a moderated garden this would have been possible. 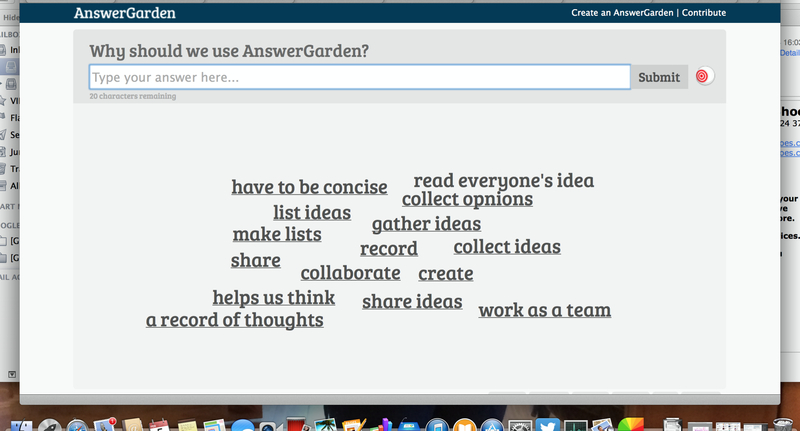 AnswerGarden had the best export features – I loved the fact that it just worked seamlessly with Wordle. 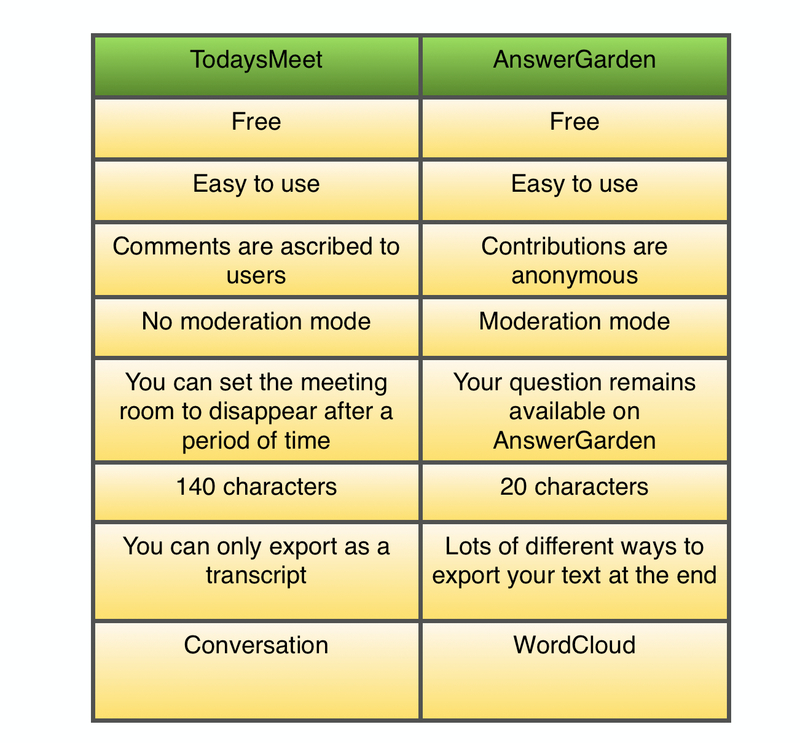 TodaysMeet provided me with an excellent overview of pupils’ ideas – I could see what each pair had decided and save the transcript to read at leisure. I see myself using both in different ways – I’ll be interested to see if the children choose to use them independently over the next few weeks.